it started with a phone call one cold sunday afternoon, not so long ago. are you free next saturday night, was the plain-and-simple question. yes, came the answer, after the requisite checking of calendar, double-checking with spouse, most likely checking in with kiddies to make sure they too could pencil it in. or tap it in, or however it is cyber-tots lock in a date these days. once secured in the affirmative, another phone call was made. same question posed, left there on the recordable secretary. and so began the cobbling of souls, the making of lists that for me is, well, about the hummingest hum i know. i am, it seems, never so quick in the pulse as when i am deep in constructing a dinner party. if given one more day of my life i think, yes, i do, i would call up everyone i love, and plenty of folks i don’t even know but would love to. i’d order up as many leaves for the table as i possibly could, break down the living room wall if i had to, to make room for all of the chairs. and then i would cook, cook, and cook some more. oh, did i mention i’d borrow plenty of knives? for, darn it, i only have nine. although, somehow, in the spoon and the fork departments, i am swimming. i think when we were married, when slim little boxes came in many-a-day’s mail, there must have been some sort of 2-for-1 sale on all the parts of the place setting, except for the parts that do cutting. which means you might come for soup, and maybe some ice cream, if you come with more than eight of your friends. and surely, hopefully, some day you’ll come. for, surely, positively, this is the truth: i would if i could spend the rest of my days dreaming up, doing, yes, even drying the dishes from dinner party piled on dinner party here at my drafty old house. to which, of course, he moaned. and i went right on vacuuming fur balls. so it was, all day saturday i found myself humming. humming, you should know, is me at my, well, purring-est. i was, all at once, cooking, setting the table, imagining the conversations. i was deciding who would sit where for maximum conversational flow. oh, and i was putting out proud tall candles, and snipping the stems of tulips. red ones in february. 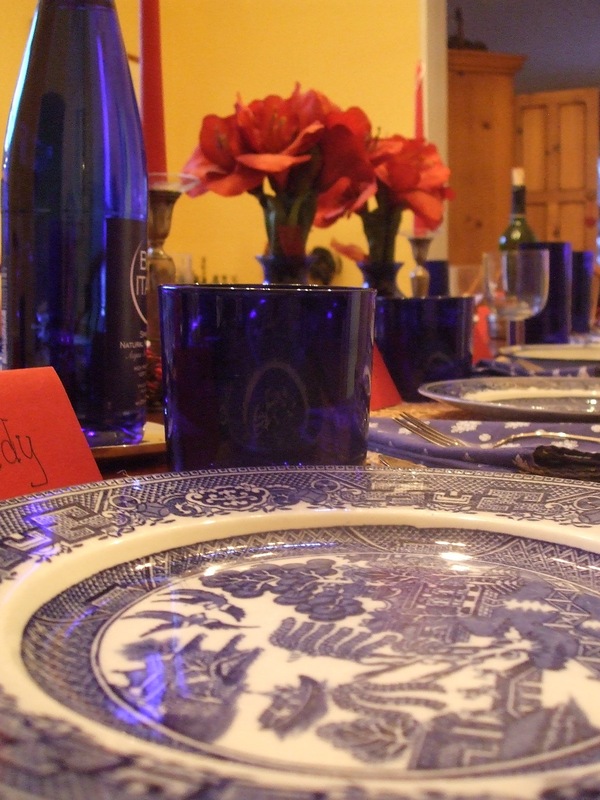 to lay out a table for a dinner party is to be bold. is to be alive, really. to be filled to brimming with all sorts of possibility. it is, i realized, as i lifted the lid on the steeping, steaming coq au vin–my idea of the perfect february dinner party dinner–the most sacramental moment, perhaps, in this holy place we call home. it is gathering friends, and sometimes near strangers. it is paying no mind to color or age, or political side of the table. it is inviting muslim to sit down with jew. it is asking the atheist to join hands as you stop and offer a few words of grace before picking up fork and, well, keep from jabbing. it is detente over dinner. it is catching a gleam in the eye as you pass down the butter. it is laughing so hard over salad, you wipe the tears from your eye–and not at all from the shallot. try not feeling fondly toward the one who pours a splash more merlot in your glass. it is, wholly, the breaking of bread, and all that that means going back to the dawn of civilization. it is eucharist, small “e,” defined: bread and wine, yes, but really, “the giving of thanks, offering graciously.” leave it to the greeks and the romans to give it a name, to launch it. the french to refine it. you and me to make it our own. it is unfurling ideas and stories there at the old family table. it is drawing out thoughts from those you’ve asked to pull up a chair. it is listening. it is returning the thought with a question. and maybe another, and another. it is, before you even get to the table, making the house come alive, igniting its reason for being. kindling lights. cranking the stove. making a fire. putting on mozart. or muddy waters. it is opening the door, with a gust of warm, wine-sodden air that can’t help but sweep in those shivering there on the stoop. and for the one doing the inviting, it begins long before the bell rings. it begins, for me, as i pluck from thin air the someones i’m dying to know, or simply to gather again at the edge of my table. the ones who i think will make for fine conversation. whose stories we might not yet know. whose ideas might rub off on my children. a dinner party with children, i’ll have you know, is the height of my dinner-party definition. oh, i love a gathering of grownups. but i believe in bringing the children, more than once in a very scant while. it is there, where the art of the napkin is figured out, that life’s lastingest curriculum is spread. i am not, never have been, one to segregate the little people. i don’t believe in banishing the squirmers off in the kitchen. oh no. let them squirm right here among us. let them learn how to listen. let them learn the art of unspooling the story. let them follow words to a simmer, then rise to almost a boil, but right then, before the lid blows, let them absorb the knack for cooling it down to a slow gentle bubbling again. and so it was, last saturday night, that i laid out a table for 12. spent the whole day, and part of the one before, toiling away. picking out cremini mushrooms. uncorking bordeaux. mismatching old plates. scribbling names onto red folded cards. not a minute felt like a chore, or anything close. it was joy, only joy, pure, simple, undiluted. there is something, i swear, to making a table that sparkles. to filling bowls and baskets and platters to spilling. to stoking the evening to come. there is dinner. and then there is feasting. saturday night at my house, we feasted. till our bellies–and hearts–were stuffed near to bursting. when it was over, the last napkin tossed down the chute, the last bit of cake tucked away, i only had room for a very full sigh. ever since, i’ve been licking my lips on all that’s leftover. and i don’t mean what’s in the fridge. do you too love a dinner party? are you daunted sometimes by the notion? or have you mastered the grace of making it seem effortless? like something you do at the drop of any old reason? what are your secret ingredients to a dinner that lingers long after the lights are turned out? do you have a tried-and-true menu that works every time? or do you indulge in experimenting on company? is there a dinner you’ll never forget, and why? Now dinner parties and entertaining, you have touched on something I am really good at if I do say so myself. I love to cook, everyone likes to be invited to dine in home and it’s an excuse to get the house cleaned up. My husband laughs as I set the table and stand back surveying the aesthetic. Flowers can’t be too high because you can’t see the person across the table. Mix and matching is good. Candles/lighting are good in fall and winter.I never worry about it, but I do think about it. I pour over cookbooks to find a new recipe, but sometimes I go for the tried and true, especially in the summer (grilled anything). I usually cook something that I don’t have to do last minute (except risotto). For adults only, six is my perfect number, but 8 is fine, too. Not a fan of the appetizer — olives, nuts, maybe a dip. Kids these days are optional. If the dinner if with families, I agree that the kids should sit with the adults; however, I find that they eat quickly, are excused and then miracuously reappear at dessert time.Although I haven’t done it this year, February is a great month to entertain to break up the monotony of winter. oh, yes, you are sooooooooo good at it. i remember the first time i was in your kitchen, with triplets running under foot, and still you made it look easy. i can’t remember what you were whipping up–you have so many things i can taste just sitting here typing, that amazing lemon-dressed salad, the brisket, and yes the risotto–but i do remember marveling at your unflustered elegance. (and note to readers: this is not some stuffy hostess who makes you feel as though you need to clear the kitchen for she is a whirling whirlwind of a perfectionist freak, this is one of the ones i’ve learned so much from, watching just how it is that she makes it look easy AND puts everyone at ease. yet always, there is that unfailing aesthetic. and she does quite a good job at collecting good minds for the gathering.) i have learned from quite a few teachers, and yes, susan is one of them……as is jan, as is brooke (my top secret long-distance tutor who regales me with all of her tales……and all of her UES tricks of the trade…..), as is crd, as is yet another susan….as is aml, as is audrey. my teachers, i see, come from a few generations. each one of them though has a pulsing aesthetic, and that ease that is priceless and the sign of a true master. the gift of sweeping the guest into so sensual an atmosphere you can’t help but let down and succumb to the pleasure, not wanting the evening to end, when you turn back into a pumpkin and limp along home…..or better yet glow for a while, knowing deep down you’re the girl who got to go to the ball. even if–especially so–it was just a great dinner in jeans. just a quick note to say that I listened to a beautiful podcast today with Jean Feraca from “Here on Earth” on Wisconsin Public Radio. She interviewed two guests on the beauty of chinese food and the poetic nature behind each dish and recipe. I think it would be a great accompaniment to the musings here. If you go to Wisconsin Public Radio and Here on Earth Radio, you can listen to the February 15th episode online.Bon Appetite! Sigh. That lovely image of a lovely evening makes me just sigh.In fact I love to entertain. Or anyway, I used to. My favorite dinner party in the world to throw–and I do mean throw, it was a very energetic affair–was Arizona Statehood Day, which happens to fall on Valentine’s Day. Days of cooking, 40 eager eaters, four courses of feasting on Mexican food. What a handy holiday to celebrate through years of boyfriendlessness. Still handy with a spouse (albeit a confused one) (he got me a cactus this year) and children to add a nice bright exclamation point to the truly miserable last stretch of winter.But I stopped doing it just before my second child’s birth. That last Statehood Day–it was too much. It just plumb tuckered me out. I finally thought that particular fire in the belly for entertaining was at last extinguished.Well fast forward five years to last week. I and my former, half-crazy co-conspirator for Statehood Day decided that we’d do just a little thing. She’d come over for dinner on The Night. She’d bring her homemade tortillas and refritos. I would do my old standard favorites: chicken mole, rice with cheese and poblanos, and sauteed peppers. Easy, no sweat. Our friend who lives with us would throw together a flan. She’d invite her boyfriend. So then: Me, two children, co-cook, live-in pal, and boyfriend. Spouse in Miami. We’re not talking about a large party here. Homework, argument-monitoring, candy regulation, what have you–a normal afternoon, except that I’m beginning to worry, just a little, about what is beginning to strike me as A Group For Dinner. Table? Well, a clean cloth. The new cactus. Sideboard covered with the detritus of making 45 homemade puppy and butterfly valentines. Floor decidedly not swept. After all, it’s just the one friend. Well, and the one boyfriend. Six o’clock rolls around and oops, what have I done, I’ve burned my mole. I’m telling you a blind monkey cooking with one arm tied behind his back could make this sauce, it’s that easy. In close to twenty years I’ve never burned it. Here it was now, curdled, scorched, balling up in the bottom of my pot. Sigh. Live-in pal arrives home from work, turns right around and leaves to fetch me tomato sauce to start over. Thankfully, the boyfriend hasn’t arrived yet. Sauce remade, no burning this time, scrambling for the water glasses at the last second, oops forgot the peppers–do I have just ten more minutes to saute them? Finally I have everything to the table by about 7:15, only a little over an hour late. My children ate so much candy this day that they maybe didn’t even notice. And bam, with all due respect, my children definitely do add, shall we say, a little too much spice to the table and I would so much like do a grown-up only dinner….someday….. The little one takes her dress-up princess dress off halfway through dinner, does her regular booster-chair gymnastics, loudly refuses every dish, and seems to be singing vulgar songs. (I’m hoping I’m not hearing what I think I’m hearing, but maybe it’s just the speech impediment.) Will this dinner never end? When was it that I liked to entertain? And does two people coming over count as entertaining anyway?Whew. I remember why I stopped doing Statehood Day. I think it will really be stopped, permanently, this time. As for other dinner parties, maybe. Maybe. In time. Maybe my children will throw them. For now it’s just too much for me to pay attention to: the gracious table, the dust bunnies, the dog, the cooking and not burning, the squabbling little ones. Susan, I could learn from you–entertaining with TRIPLETS underfoot! And bam, your neverending enthusiasm for the goal of that entertaining–the joy of bringing folks together–is inspiring.I love doing a dinner party. But I love it, I think, only in my imagination. That’s what happens when I get creative with the space bar…oi! I typed my name (Michael) under “Comment As” with an increasing number of spaces between letters (creates a cool effect) and look what I get! So sorry. Yikes. Colorful dinner party going on here this week! Michael…even though I don’t know you…I was pretty sure that fancy schmancy sig was yours, so glad you confirmed it. This meandering reminded me of family dinners growing up with my family of 10, grandparents thrown in for good measure and then those “uncles” who would show up because they lived alone and sometimes Sundays just got lonely. The various “uncles’ always knew my parents welcomed them into the fold. Us kids just thought they really were our uncles since we had so many anyway.And there was my inspiration for entertaining, dear mom who could throw together dinner for 15 to 20 with nary a blink and a baby underfoot – well except maybe the rolls which pretty much always got burned. She was one of 15 kids so I think that is just seemed normal to her. Therefore I love entertaining as does my sister. We were chief lieutenants at an early age. I know when I married, the concept of dinner for just two was way beyond me! It felt very strange. Wonderful and delicious words to savor this week – thanks one and all….and True – I’d love to be a stranger wandering into your dinner party! Sounds marvelous. Now I am going to go catch me a lunar eclipse for dessert. as you well know, i learned from the best. two people who would rent a jukebox stocked with 45s from the ’60’s for a summer dance party. who invited all to ‘dress as your favorite gangster or gangster’s mistress’ for a valentine’s day massacre theme party. only in chicago and only my parents. first communions, christmas, saturday…any reason to haul out the waterford and press monogrammed cocktail napkins into service. i could hardly sleep for spying on the adult conversations buzzing into the wee hours. oh, to think of the glorious adult party food leftovers i would gorge on the following day.i was home this weekend (ny is not yet home in my heart), in the condo where my husband still resides and i wanted nothing more than to cook all day and fill the house with friends. i’ve been missing that glow in ny. so, i spent hours kneading and patting out meatballs; sauce simmered all afternoon; and the friends i’ve missed showed up with wine in hand. i too pull out that wedding china even if it’s just a meatball sub i plop on the pattern. this gathering is the most fulfilling – and yes you of course nailed it – sacred of moments.nothing fills me up more either. sigh. And to ALL above I say … what time is dinner and what can I bring … I’m THERE! Would love to sup with each and every one of you! bam … what I wouldn’t give to have been at that table listening to such delicious conversation while enjoying delicious food.jcv … you crack me up. I just have to meet that little dress-up princess someday. And, here in the snowy mountain regions of Arizona, I can truly appreciate the Statehood Day theme … maybe we’ll throw a party together someday … wouldn’t that be great fun!